Let’s picture a real-life scenario: There’s a movie that you’re dying to see, and you’ve heard some buzz about it, but you haven’t seen the trailer yet. Then one day, the trailer is released, and your heart flutters with excitement, because this made it all real and you just can’t wait to see the entire film after an amazing teaser that left you wanting more. Now, let’s apply this to the world of your wedding…your invitation suite is the wedding equivalent of a trailer for your big day! It’s a preview of what your guests can expect, a glimpse of your color pallete, a small peek into the vision you’ve had in your head for the longest time. Will your day boast deep, rich colors with a desert, boho aesthetic? Or will guests be greeted with soft, romantic tones in a garden setting surrounded by candlelight? This is your chance to excite your loved ones and begin the process of bringing your vision together, so you of course want your invitations to be stunning! I’m so happy to share that I’ve partnered with Basic Invite to help you create a custom invitation suite that not only reflects the vision for your wedding day, but gives you a palpable keepsake that will bring back a flood of memories every time you hold it in your hands! Your invitation suite is one of the first visual representations of your wedding, creating an initial impression of this experience for whoever is involved. They set the standard for your day, so it may be a really good idea to use them as inspiration and build your day around them. They can also act as sort of a “mood board” to show your vendors what you’re picturing in your mind. You could even bring them in your purse while choosing colors for linens, bridesmaid dresses, florals, pocket squares, anything! What an easy way to stay consistent with your colors! Basic Invite offers over 180 color options (even clear!) when designing your cards with instant previews online, so it makes it so easy to make your vision come to life. You can even choose from 40 different envelope colors, such an awesome touch! Even if you’re indecisive like me with colors, you’re able to order a printed sample before pulling the trigger on your full order. Once you nail down your color palette, you can choose the style of invitation you’d like to match your vision. I would highly suggest their seal & send wedding products, which are an all-in-one wedding invitations with a tear-off RSVP postcard included. It’s so convenient and would make for gorgeous flay lay stationary photos (says the photographer)! 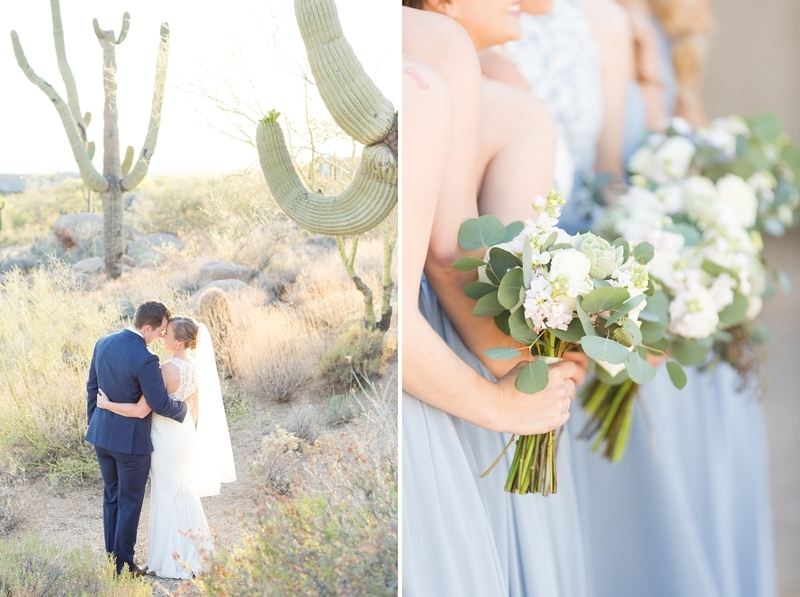 Lisa and Riley were going for an elegant, desert vibe with a touch of modern romance. 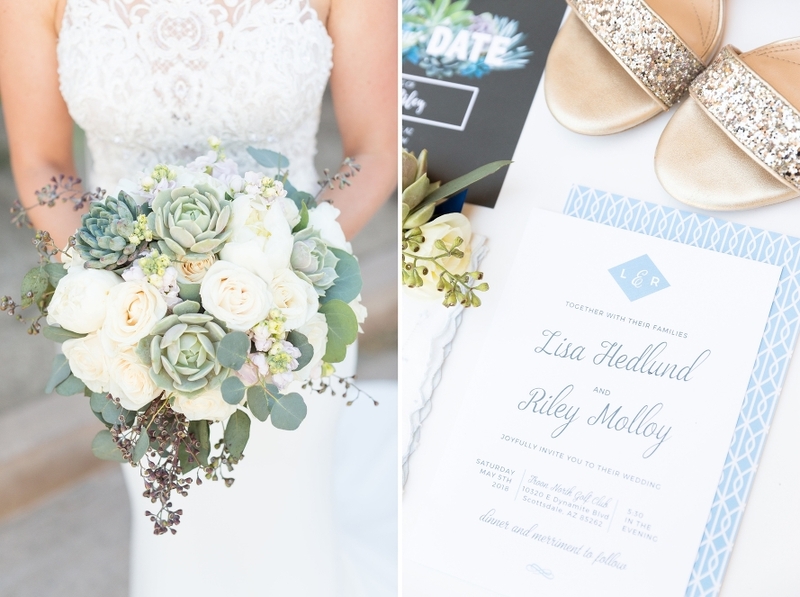 Their dusty blue tones mixed with pale green succulents kept popping up throughout their wedding day, creating a clean, clear vision of what they wanted their guests to experience. But more importantly, what they wanted to experience and remember forever. After your guests have been given their “preview” of your day, it’s such an thoughtful touch to carry the look and feel of your paper products throughout their entire experience. From when they arrive and sign your guest book, skim their ceremony card as they excitedly wait for you to come down the aisle, and sit down and read the dinner menu, you’re telling them the story of your wedding day. These small details are part of what they’ll remember, but what you’re gaining from consistency is so much more. Your guestbook is a treasure that you’ll keep for the rest of your lives, with hand-written notes from those you love most in the world. Notes from those who will one day be gone, and you’ll hold onto their words so tightly. You’re able to create a guestbook to match your invitations directly through Basic Invite, and it makes it so easy to compile so many components on your wedding planning checklist! 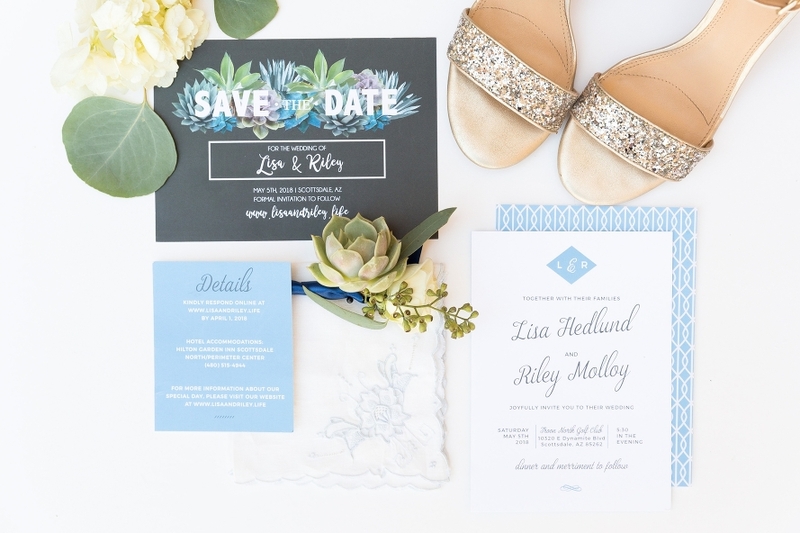 From a photographer’s standpoint, paper products with matching fonts, colors, everything, will make for gorgeous printed spreads to create an elegant, simple wedding album to sit right next to your guestbook on your coffee table. LOVE. This goes hand-in-hand with the importance of consistency, but one of my favorite features of Basic Invite is their free customizable wedding websites. You guys, they’re absolutely gorgeous and simple! You can choose the exact same colors and design features of your wedding stationary and implement them on your site! You can also upload photos and a map with directions to your wedding, along with your love story and details of your day. This is complimentary to your service and such a personal touch. They also offer a free address collection service to request your addresses with just three simple steps: Share a link, collect addresses, and get free envelope printing. I know when planning a wedding, anything free is always a bonus and usually a rarity! I love that these things are offered! And after all is said and done, after your wedding day is over, you’ll be left with very few physical mementoes of that day (aside from photos). Holding a palpable, personal keepsake will instantly transport you back to not only your wedding day, but your engagement and planning process for the rest of your lives. Make it count. Make it easy. And have the best time creating this incredible memory together, one you’ll hold onto forever. Cue the happy tears! 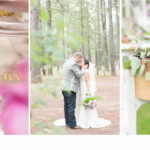 While this blog post was sponsored by Basic Invite, this was a real wedding I shot whose couple used Basic Invite’s services to create their paper products! Click below if you’d like to see more!